English cottage style should always be a reflection of your personality and your lifestyle. The English hardly ever use interior designers to decorate their homes. Furniture can be handed down, antiques passed along, treasures bought from travels abroad. English cottage style is eclectic and personal but it helps to understand who used to live in cottages to find your style. The first mediaeval cottages would not have been decorated, of course, basic survival was far more important. There would have been a few farm tools hung up on the walls, when not in use and fragrant herbs and flowers on the floors to ward of smells and vermin. English cottage style has come from the various people who lived in cottages. The very poor would not have much in the way of décor but they were not the only ones who lived in cottages. From the farm labour to the wealthier Yeoman, the town craftsman and merchant, the aging spinster, house keepers and governesses, gentlemen who were neither rich nor poor, to the fisherman, gamekeeper, lockkeeper’s and lighthouse keepers cottage, and the Gentry looking for a taste of the good life with the ‘cottage orne‘, they all had an influence in the English cottage style. The cottage orné or picturesque cottage suggested a romantic ideal of cottage life and was constructed during the late eighteenth century inspired by the Cult of the Picturesque, many spectacular English Cottages were built on the grounds of English estates and are larger than most old cottages. This creates another element to English cottage décor, the more aristocratic English country style. Queen Charlotte who was the wife of King George III (1738-1820)had a cottage in Kew Gardens that is a perfect example of a cottage orné inspired by the Cult of the Picturesque. It was designed as a country retreat for family picnics and afternoon tea and had a few animals including kangaroos! The English have always been travelling and trading around the world for centuries. Exotic goods, ethnic fabrics and all kinds of eclectic treasures have come into ports and circulated from the coast to London and then into the countryside. The first born son of the manor house would go on the Grand Tour of Europe and sometimes Africa and bring back antiques from France, Italy and terracotta pots from Africa, and all manor of furnishings and decorations for the Manor house from his travels. Many treasures would have ended up in the cottage when the furniture became unfashionable, or if the room was just overflowing with too much décor, their old spinster aunt may get a few furnishings for her cottage. During the peak of the Victorian era when transportation was improved from the invention of the steam engine it allowed all these foreign goods to be transported around the country the English style was almost becoming lost from the passion of collecting these foreign finds. England was also becoming a mass manufacturing nation which lead the English Arts and Crafts movement started by William Morris. The arts and crafts movement in England combined the notion of the simple life, back to the land and communion with nature. The interiors of country houses and cottages has little changed over the years. The English style has always been simple, eclectic and, most importantly, comfortable. Every English home has an armchair normally by the fireplace or in an area perfect for socialising, relaxing with a drink or reading a book. English cottage style and English country style is an emotional reflection of the designer. It is an honest look into the life of the person who lives there. A guest should be able to read you like a book when they enter the room. It should be romantic without frills or fuss, and should always express a nostalgic love of the English countryside, nature and be reduced to the essentials to reflect the simple life. To create your own English cottage style simply collect your own treasures that reflect you and your lifestyle, bring elements of nature inside and find furniture that speaks to you. Fabrics can be worn, eclectic pieces of furniture can be together in one room. To learn more about the English cottage style visit cottages and homes open to the public, the National Trust has many to choose from. You can also visit the home of Shakespeare wife; Ann Hathaway’s cottage in Warwickshire to see the Quintessential English cottage with its original décor. 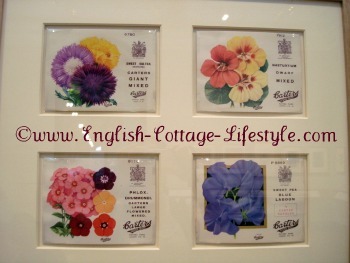 Also read books on English cottage style and stay tuned to ECL for more on English Cottage Decorating.